Can you set cage traps inside the attic to catch the squirrels? That's the first thing many people think when they have squirrels in the attic. Seems to make sense - the squirrels are in the attic, so that's where the traps should go. And behold! What do we see here? Squirrels caught in traps in the attic! There's just one problem - this photo is a fake. 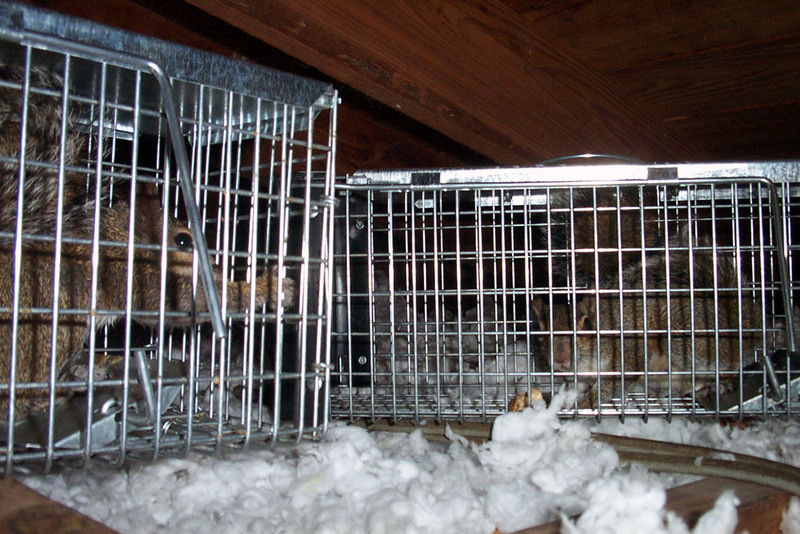 I actually caught these squirrels outside the attic, with the cages mounted on the roof. Then I carried them inside and set them here for this photograph. Why? I just wanted this photo for my stock collection. In my years of wildlife control, I've never been able to successfully catch a squirrel with a trap set in the attic. They just won't go in. Besides, a trap in the attic has to be checked frequently to ensure you don't have a suffering squirrel, it's harder to access, etc. But bottom line, it just doesn't work. Set the traps outside, on the roof near the entry hole, or better yet, set a repeater trap right on the hole.